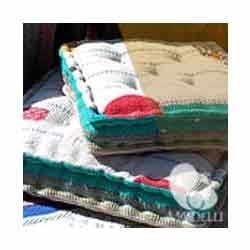 With the support from our skilled experts and high-end technologies, we are able to offer exquisite range of Vintage Saree Floor Cushions to our esteemed clients. These one of a kind saree floor cushion are specially manufactured by using vintage Kantha sarees to ensure their easy usage and durability. Our offered products are available in different designs and colors to meet the precise needs of our clients.